A key goal in business is satisfying your customers, right? Wrong. Satisfaction is a word that has become synonymous with customer service, but we don’t believe it’s good enough. In legal terms satisfaction can mean repayment of a debt. It can also mean having your expectations met. Sure, when you go to a store you want to be repaid in goods or services for the money you’ve handed over. This completes the transaction. You also have an expectation that when you pay your money, the goods or services will be provided as you expected them to be. Again, the business has been settled. But is that what customers are really after? A satisfactory transaction that meets their expectations? Yes and no. We say it’s the bare minimum of what your business should provide, not its ultimate goal. Satisfactory service keeps your customers staying – for a while. At least until they get a better offer. Delighted customers keep coming back time and time again, and bring their friends. You want to provide the kind of service that gets people talking about your business, and turns your customers into a tribe of loyal followers that wouldn’t go anywhere else. When teaching our own clients about how to provide exceptional customer service, we first ask them when they’ve experienced it. For some it might have been when a business has gone above and beyond to fix a problem, thereby turning a bad experience into an exceptional one. One of our clients had checked into a hotel room which wasn’t cleaned (there was even still dirty sheets on the bed). The hotel fixed this by providing an apology, a clean room, and a return stay for free in the best suite of the hotel. They fixed the unsatisfactory service with an exceptional experience. Another client checked into a hotel and the room wasn’t ready when promised. They were given free drinks at the bar while they waited, and their drinks for the remainder of their stay were complimentary. It’s natural for businesses to make mistakes now and then, but how they fix them can either break their relationship with the customer, or get them a customer for life. Of course, the best customer service is given straight off the bat. As a customer, when have you received something unexpected, surprising or delightful? I once attended a hair salon in the U.S. that had its own DJ spinning tunes, and wine by the glass. That was unexpected. A week after that visit, I received in the mail a hand-written card from my stylist, saying how much she’d enjoyed our discussion about a particular topic. That was delightful. Did I go back? You bet. Your customers need certain things from you. This is what they pay for and what they expect. There are also certain things you could provide that they desire. This is what delights them. You may find that things you are currently doing (eg. appointment reminders, coffee on arrival, gift on their birthday) have actually become expected, and are no longer adding extra value to your customers. They would expect to get them from anyone who provides your product or service. There are other things that you can do above and beyond that they would love. Have their favourite coffee ready for them at the start of their appointment, ask how their son’s soccer grand final went, buy them a book you know they’ll love for no reason, serve pastries from their favourite patisserie at your next meeting. It doesn’t always have to be a grand gesture to be delightful service that makes them feel appreciated. Think about things you’ve done for your customers in the past that have delighted them. Do more of those. Ask your clients: What would delightful service look like to you? What would keep you coming back time and time again? And if you mess up? Make up for it with exceptional customer service, something that will get them talking about how you made up for the mistake rather than the mistake you made. As a business owner, it can be hard to see from the outside in to get your customer’s point of view. 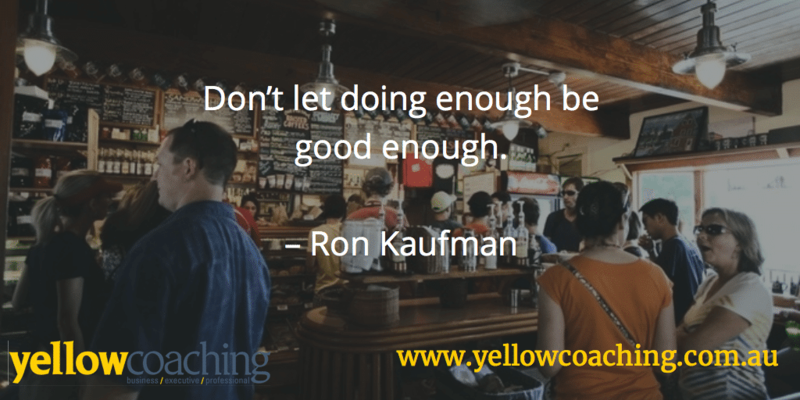 Your business coach can help. Call (02) 4933 6622 if you’d like to find out how.